UKULELE NOIR at Mockingbird Music in Mansfield Mass. Pearls Before Swine is fast becoming one of my favorite comic strips. But I do have to take issue with this strip, which appeared on January 30th, 2008. As we all know, Jimi Hendrix did indeed play the ukulele. Okay, a one-stringed uke. And only until he could afford an acoustic guitar. Anyway, it's still a brilliant strip. Hey, NoCal ukers, Lil' Rev is in the vicinity and is putting on a variety of performances and workshops. This week he's in the Santa Cruz area. Click here to see his current calendar. Workshop and concert at Mike DaSilva's on Sunday, February 24th 2008! Heading Mendocino and Oregon way in March. Don't miss him! "I'd like to know what all the instruments were in the picture, particularly the instrument on the left front. It looks kind of like a tenor scale ukulele, is it a parlor guitar or some other instrument?" I trust our readers will be able answer this in about 10 seconds. If you know, please leave a comment by clicking on the "comment" link below. By the way, the leader of this quintet is Henry Kailimai, who penned "On the Beach at Waikiki." Henry Ford caught the quintet's gig at the Hawaiian Pavillion and liked them so much that after the PPIE he hired them to be the Ford Motor Company's house Hawaiian band. They recorded under the name of The Ford Hawaiians. The New Yorker recently ran an illustration contest in which they invited artists to submit their contemporary interpretation of the iconic Eustace Tilley, the magazine's "presiding dandy." Winners were selected to appear in the current (February 11th/18th 2008) issue. They received nearly 300 entries, which you can see here. A brilliant handful were selected for reprinting in the magazine. One of winners, "Leather Daddy Eustace," was drawn by ace cartoonist and Ukulelia pal Jerrold Connors, host of the popular and value-packed Ukulele Boogaloo. If I were a completely narrow-minded geek, I might be slightly miffed that Jerrold didn't submit a uke-playing Eustace, but who am I to argue with genius. Congratulations, Jerrold. You done good! So, I’m slidin’ down a street in Ukuleletown in my ’54 Mercury and I turn on the radio and this british bluesman blows out of the AM playing, of all things, a slide biscuit tin ukulele! I tracked him down on the internet later….This is a killer video from Rob Collins, a self confessed low tech luthier in the English town of Hebden Bridge. It’s called “Can’t Be Satisfied”. 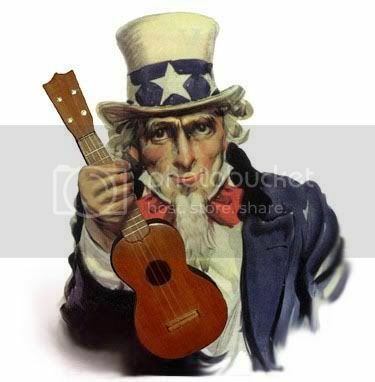 It's Super Tuesday, so if you live in a state with an election today, grab your uke, and get out there and VOTE! This is a demo of a song written in 1927 by Jolson, Rose and Dreyer. It was recorded in 1928 by Ruth Etting.